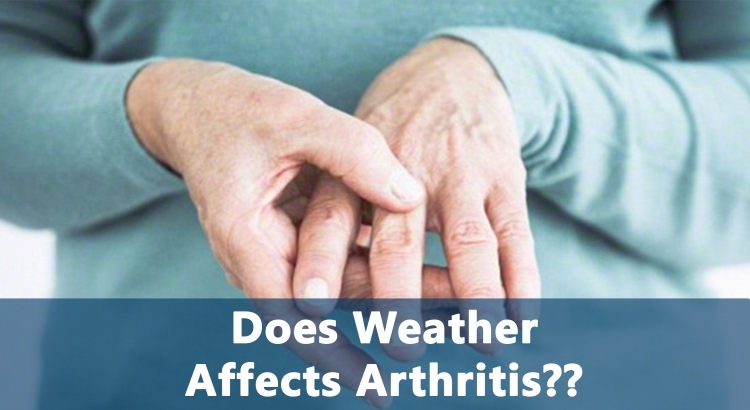 Does weather affects arthritis joint pain?? Arthritis is basically inflammation of the joints. It can affect one or multiple joints. There are around numerous types of arthritis with varied causes, symptoms and treatment methods. Two of the most common ones among them include - Osteoarthritis (OA) and Rheumatoid arthritis (RA). In general, the symptoms of arthritis occur in adults over the age of 65, but in some cases, it can also be observed in young children, teens, and younger adults. Moreover, it is more common in case of women as compared to men. Joint pain, stiffness, and swelling are the most common symptoms of arthritis. It may lead to a reduced range of motion and redness of the skin around the joint. In case of RA, fatigue, fever, and loss of appetite are caused due to the inflammation of the immune system’s activity. Severe RA can also cause joint deformity if left untreated. RA is an autoimmune disorder. It occurs when the body’s immune system attacks the tissues of the body. RA can eventually lead to the destruction of both bone and cartilage inside the joint. OA on the other hand, is caused by normal wear and tear and is one of the most common forms of arthritis. One’s risk of developing OA is higher if they have a family history of the disease. The general consensus is that cold wet weather is the worst for inciting arthritis pain.Changes in barometric pressure – a measure that refers to the weight of the air – seem to be more important for pain levels than the actual barometric pressure. This means that either a cold front or warm front coming in can ramp up the ache in your fingers. But once the weather has settled in, your pain will even out.A2015 study of 10 people with OA published in Journal of Rheumatology found significant links between humidity, temperature, and joint pain. The effect of humidity on pain was stronger when the weather was colder. A 2015 study of 133 RA patients published in Rheumatology International found that their disease activity (swollen joints, pain) was lower when their days were sunny and dry. Changes in barometric pressure can cause expansion and contraction of tendons, muscles, bones and scar tissues, resulting in pain in the tissues that are affected by arthritis. Low temperatures may also increase the thickness of joint fluids, making them stiffer and perhaps more sensitive to pain during movement. While there’s no certain cure for arthritis but the right kind of treatment can greatly reduce the symptoms. In addition to the treatments recommended by the doctor, one can make a number of lifestyle changes that can help them manage their arthritis to a great extent.